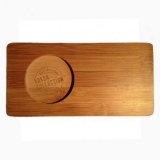 Set of 5 tags for use with Kokoa Glass & Teak Wood Display Jars. Set includes 1 tag of each for Ivory Coast White Chocolate, Venezuela (58% Cocoa), Ecuador (70% Cocoa) Haiti (75% Cocoa) and Madagascar (82% Cocoa). Tags only - Jars not included.